Lineage. Organized in the NG as 104 Fighter Squadron on 29 Jun 1921; Redesignated 104 Observation Squadron on 25 Jan 1923; Ordered into active service on 3 Feb 1941; Redesignated 104 Observation Squadron (Light) on 13 Jan 1942; 104 Observation Squadron on 4 Jul 1942; Inactivated on 18 Oct 1942. Activated on 1 Mar 1943. Redesignated 104 Reconnaissance Squadron (Fighter) on 2 Apr 1943; 489 Fighter Squadron on 11 Aug 1943. Disbanded on1 May 1944. Reconstituted on 21 Jun 1945. Redesignated 104 Fighter Squadron and allotted to ANG on 24 May 1946; 104 Fighter Squadron extended federal recognition on 17 Aug 1946. 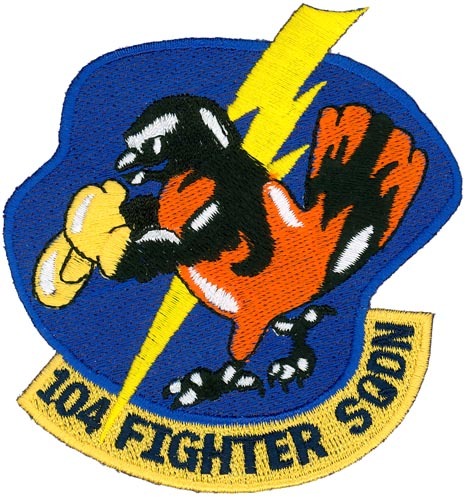 Redesignated 104 Fighter Interceptor Squadron in Aug 1951; 104 Fighter Bomber Squadron on 1 Dec 1952; 104 Fighter Interceptor Squadron in Jun 1956; 104 Tactical Fighter Squadron on 10 Nov 1958; 104 Fighter Squadron on 15 Mar 1992-. Assignments. MD ANG (divisional aviation, 29 Division), 29 Jun1921; II Army Corps, 3 Feb 1941; 59 Observation Group, 1 Sep 1942-18 Oct 1942; 59 Observation Group (late Reconnaissance; Fighter) Group, 1 Mar 1943-1 May 1944; Maryland ANG, 17 Aug 1946; 175 Tactical Fighter Group, 1 Oct 1962; 175 Fighter Group, 15 Mar 1992-1996; 175 Wing, 1996-. Aircraft. JN-4 (includes JN4D, JN4H and JNS),1921-1927; TW-3, 1925-1930; O-2C, 1926-1927; PT-1, 1927-1933; O-11, 1928-1932; O-17, 1928-1933; BT-1, 1929-1934; O-38, 1930-1937; O-49, 1935-1942; O-46 -1937-1941; O-47A, 1938-1942; O-47B, 1940-1941; BC-1A, 1940-1941; P-40, 1943-1944; P-39, 1944; AT-6, 1946-1955; C-47, 1946-1959; B-26, 1946-1950; L-5, 1946-1950; P-47D, 1946; F-51H, 1951; F-51D, 1954-1955; T-33A, 1954-1970; C-45H, 1954-1956; F-86E, 1956; F-86H, 1957-1970; C-54D, 1967-1968; A-37B, 1970-1980; C-131A, 1972-1977; A-10A, 1979-2007; A-10C, 2007-. Operations. WW-II, Antisubmarine patrols, Replacement training. Cold War, Defend the Baltimore-Washington area against possible Soviet bomber attack. Emblem. Approved on 21 Sep 1953.